The NYPL Labs’ Brian Foo (another of whose projects featured in an earlier post) has made the Green Books available– and interactive: you can map a trip or plot the books’ data. 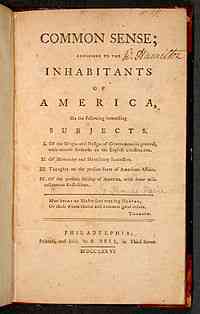 As we live like a refugee, we might recall that it was on this date in 1776 that Thomas Paine first published (albeit anonymously) his pamphlet “Common Sense.” A scathing attack on “tyrant” King George III’s reign over the colonies and a call for complete independence, “Common Sense” advocated immediate action. America, Paine argued, had a moral obligation to reject monarchy and declare independence. An instant bestseller in both the colonies and Britain (over 120,000 copies in just a few months), it greatly affected public sentiment at a time when the question of independence was still undecided, and helped shape the deliberations of the Continental Congress leading up to the Declaration of Independence.